This site uses 100% standards-compliant XHTML and CSS. Big figure digital display of width to 0.1 inch or centimeter precision with simple keyboard entry of set point and limits for high and low LED alarm indication and internal alarm relay actuation. Water-tight, durable enclosure designed to withstand the harshest of mill environments. Type WM-2400 Width Sensors use collimated sensing elements at 0.1-inch intervals allow precise width measurement which is unaffected by cloth position or play. Can be used in full-span or edge configurations to meet all processed widths. 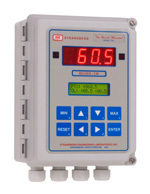 Industry standard, scalable 4-20mA output measurement value, allowing the unit to be easily integrated into higher level control or monitoring systems. Collimated sensing elements spaced at 0.1-inch intervals allow measurements unaffected by material position or play. Sealed sensor enclosures allow use in the most harsh processing enviroments. Sectional sensor design from 32 centimeters (12.7 inches) to 130 centimeters (51.1 inches) can be used in full-span or edge configurations to meet all processed widths. Width Interface Type WMI-140 connects to up two sensors and light sources to provide precise digital output signals, allowing the unit to be easily integrated into higher level control or monitoring systems. At your wit's end trying to get control over your manufacturing process? Running out of ideas to increase your yield, improve consistency and quality, or reduce your energy costs? Why not take advantage of the expertise of our staff of applications engineers? For over a half-century, Strandberg Engineering has been providing solutions to these problems - and increasing our customers' profits. Our staff can assemble the perfect combination of sensors and controls to put you back in command of your manufacturing process.